There is no question that Kurt Angle was an amazing technical wrestler who helped make Smackdown must-see TV in the early 2000s as part of the Smackdown six. His wrestling acumen, built on Olympic-level training and performance (and his broken freakin neck!) crossed with a clueless self-deprecation that made him beloved to the WWE Universe. His time in TNA did him few favors, but his return for his Hall of Fame induction in 2017 helped us remember why we loved him so much. Shortly after WM33 Kurt was appointed General Manager of Raw. He's butted heads with the McMahons, run afoul of the EVIL BOSS DR LEVESQUE, had to deal with Monsters, Demons, Wild Samoans, whiny Canadians, a talented illegitimate son(which was my headcanon before WWE did it) and, in his own words, "What the hell happened to Matt Hardy?". He's handled it much like a father who decides to go into teaching high school with absolutely no idea how he can keep all these kids in line. He's commented a lot recently about how his show is going off the rails, with the added pressure of "Constable" Baron Corbin in his ear and Stephanie McMahon on Corbin's speed dial. While he couldn't always corral the Raw Superstars (who can?? ), he has had to deal with an elephant missing from the room. The continued "Absence" of Brock Lesnar from TV in an effort to give the Universal Title some meaning is backfiring; fans want Brock stripped of the title and have been asking for that well before Extreme Rules. I've spoken with fans at house shows who have commented that they wouldn't care if Curt Hawkins won the title if it would get the belt back on TV or that the IC champ is the A-Champ on Raw (current IC Champ: Dolph Ziggler). What's a GM to do? Brock has LONG violated the 30 day defense rule, shows up here and there to tease fans, but most of the time do what Austin did(more often) about 15 years ago - show up, do finisher, leave. Kurt sounded like he was growing a backbone at Extreme Rules - just in time for Summerslam season! But this backbone could be further straightened by one of the most potent weapons in wrestling: Exact Words. "I recently re-opened negotiations with Paul Heyman and the rest of Brock Lesnar's team of when his next title defense would be. Unfortunately, Paul Heyman has informed me that Brock Lesnar is not interested in returning at this time. I'm tired of it, and I know the WWE Universe is tired of it. Brock Lesnar refused to participate in a multi-man match I put together several weeks ago, and I had to cancel that match. Brock refuses to face ANY opponent in the WWE, but shows up at UFC and gets in the face of their champion. So I am issuing Brock Lesnar an ultimatum: he either shows up tomorrow night on Raw, or he can come to terms on when his next title defense will be, OR I'm going to strip Brock Lesnar of the Universal Championship." I certainly got my hopes up; because according to Kurt's Exact Words, BROCK has to show up - Not "Uncle Paul", not any mooks in whatever elk posse Brock runs with - Brock HIMSELF has to show up, come to these terms, or fork over the belt. I might be over-simplifying it, but when Exact Words about which McMahon signed the papers for the WCW purchase, or when a GM would pit someone against "A Dudley" or more recently "A Singh". these words have more meaning and help the storyline along. "Last night I gave Brock an Ultimatum: he could either show up here tonight on Raw, or agree to terms on when his next title defense would be, or I'll be stripping Brock Lesnar of the Universal Championship!" Again, the crowd erupts. A "Strip the Belt!" chant begins, which had I been there I would have happily participated. "It's been over 24 hours and I have not heard from Brock or his representatives. So I am hereby stripping Brock Lesnar of the Universal Championship right now!" In the middle of that declaration, a WILD PAUL HEYMAN APPEARS! But from his timing, Uncle Paul should have been told it was too late, the declaration had been made. Secondly, Angle said at the PPV that he needed to hear it from Brock HIMSELF. "Uncle Paul" doesn't count here. Kurt Angle cuts off Heyman as he starts his usual introduction - and in a rare moment, I shall compliment the truck for cutting away from Paul before his chyron completely came up. "We all know who you are and we know who you represent. Now, if Brock Lesnar doesn't come out here right this second, you're just wasting my time." Kurt is adhering to his Exact Words at this point, and by rights his edict should be adhered to anyway. "That's an interesting way to put it, Mr. General Manager. My CLIENT, BRRRRROCK LESNAR..... is not here this evening." Right there. RIGHT. THERE. Angle could have made Summerslam 1000% more interesting by giving Uncle Paul the boot and demand that the belt be handed over. Kurt wastes no time. "Well, you leave me no choice, I'm stripping Brock Lesnar-"
No "Whoa", no "wait", the ultimatum has been thrown down. Twice. Brock is not in the building, Heyman said so, that belt should no longer belong to him. 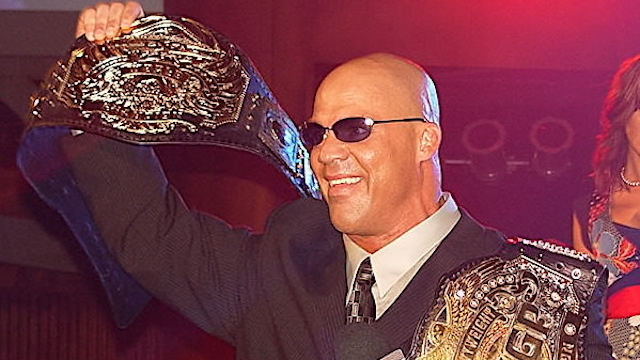 And Angle had the entire arena behind him as a "STRIP THE TITLE!" chant started up. Please, Kurt. This is the part where you have Paul E in a verbal AngleLock. "I assure you [...] Brock Lesnar loves being in WWE. Brock Lesnar loves being Universal champion." No, Brock Lesnar loves collecting a paycheck while he sits on his porch in Calgary shooting elk and drinking beer. "Then why the hell doesn't he show up??" Angle demands. The ride's getting bumpy; Angle could have stood his ground here just to see if Heyman would go to his knees. Paul E tries to spin it with what I see as the absolute worst case scenario - Lesnar as Universal Champion and UFC champion at the same time? Somewhere, Vince McMahon and Dana White are still laughing at the prospect and are probably still debating if they want that to happen. I don't like UFC in my WWE no matter how many Superstars have done MMA along with their wrestling careers. UFC fans would hate it - as in "Not buying tickets" hating it. WWE fans with Summerslam tickets might start having second thoughts as well. Then, Heyman softballs Angle with the comment about Brock having the UFC and Universal championships "...the same way [Kurt] challenged, in your prime, for all of the WWE titles with the Olympic gold medals strapped around your neck." Brock with two belts =/= Angle's early WWE career. Kurt was three years removed from the Olympics and I'm sure contemplated trying out again DESPITE the limitations from his broken freakin neck. Lesnar is past his prime for UFC and WWE can't risk another PR nightmare of Lesnar getting popped for PEDs again like he had in the recent past. WWE doubled down about "not testing part-timers" but if you're gonna take belts away from guys that violate the Wellness policy, and in this case someone who is supposedly the face of the company (AJ Styles is the face of the company now! ), then Kurt shouldn't even be giving this a second thought. "If that's Brock's 'goal', then more power to him!" Angle gets his footing back under him. Then he takes the train and rides it off the rails, demanding that Brock defend at Summerslam or he is no longer champion. Uh, Kurt? Just a few minutes ago you stripped him of the belt, keep with that, trust me. People will be much happier. A new chorus of "Strip the title!" erupts from the crowd as proof of that prior edict. "Gimme an answer right now, Paul." It's too late for that answer - you should just strip it just to see Paul E cry. Heyman accepts the challenge and then tries to spin it again. "I want to thank the WWE Universe for your voices have been heard! You want MORE Brock Lesnar!" Good heel spin, but judging from the level of boos that came up when you agreed to bring your pet Machamp to Summerslam, stripping the title still sounds like a hell of an idea. Though I'm also guessing that he's using the statement in his own (kayfabe) way of saying "THANK YOU FOR HATING ME AND BROCK! THAT IS THE CORRECT REACTION! LOOK AT WHAT GOOD HEELS WE ARE!" "But wait, Nikki," I hear you asking, "What would YOU have done here? We're getting Lesnar to actually perform at Summerslam! It'll probably be against Roman again.... or Lashley....."
Given that most of the wrestling crowd is sick of seeing Roman/Lesnar and Lashley/Lesnar would have been something 10 years ago, I think I do have a better solution. "Well Paul, for someone who likes to manipulate people, you sure don't know how to listen. I said last night and I said before you came out here to interrupt me that BROCK LESNAR had to come out here and give me his choice of defending, negotiating, or surrendering the title. And since he's not here, my edict still stands. Brock Lesnar is no longer Universal Champion." Paul E's eyes bug out, he drops the mic and starts begging - PLEADING with Kurt as the arena is celebrating the unceremonious end to a title reign that hasn't meant a damn thing for two years. Angle should then have summoned security to carry Paul out of the building to one of the biggest face pops for someone not named Daniel Bryan. The "Na na na na, hey hey, goodbye!" singalong would have been loud, proud and might even go through a commercial break. Think about when Heyman was thrown out the Raw after Survivor Series 2001. So where does that leave us? Angle has multiple candidates just chomping at the bit for this one. If you don't go to commercial after Heyman's been removed from the building, the rest of the segment - in a style I call How Many Microphones - people come out and stake their claim. If you get the commercial break, now you get something called compelling story - with the built-in answer that Lesnar will NOT be Universal Champion. -Bobby Lashley could still comment that beating Roman should put him in the conversation, and emphasize Roman's failures after several attempts. -Drew's promo wouldn't change at all, as it lays the seeds for dissention with him and Dolph Ziggler, which can be addressed down the line. -Rollins would say "if you're looking for someone to be your new Universal Champion, I'm RIGHT. HERE." He'd have a case given the matches he has put on this year. -Elias and his handsome Fender guitar to ask his question and remind Kurt what WWE actually stands for. He can plug his album and talk about all the good PR that would come from having someone multi-talented as champion. He might even write a song for Kurt. -Balor can stake his claim the same way- he's never received his rematch since recovering from his shoulder issues and thinks that he's been way too nice about getting back into the picture. -When Roman talks to Kurt about the situation, Kurt might have some reservations about Roman being in the title picture given his track record over the last few months. Roman won't attack Kurt over it, but he might go after Lashley and Elias to prove his point, and Rollins has to try and stop him from doing any more damage. Over the next 2-3 weeks we do round-robin matches with these guys, maybe throw Corbin, Strowman, KO and Ziggler in there for seasoning. Angle could narrow it down to a six-pack challenge with those from the opening promo. It's narrowed down to a triple threat where Strowman calls his cash-in at Summerslam - let's say Strowman, Drew and Lashley. The match would be a great big schmozzy mess! Kurt is at the top of the ramp demanding that they stop fighting so that the match can continue as booked. No one is listening, of course, and Kurt is about to send refs and agents out when the arena goes completely dark. Demon Balor, crouched on the top turnbuckle with the belt on his shoulder and staring down Angle. THAT, I would pay $500 for. THAT, crowds will get behind even if it's a little ridiculous. THAT is compelling and admittedly Russo-esque. But THAT is a whole lot better than Angle caving in and we have Lesnar facing Roman and Lashley at Summerslam with a potential Braun cash-in. Crowds will be more engaged in getting themselves over and chanting random things at the match and otherwise disrespecting the performers and continuing to show displeasure at the booking. Dork. You could have saved us.